The S&S Season for Scamps is designed to capture the imagination of all ages, whether you are 5 or 105, with works of visual and physical theater by world-renowned artists and playwrights. 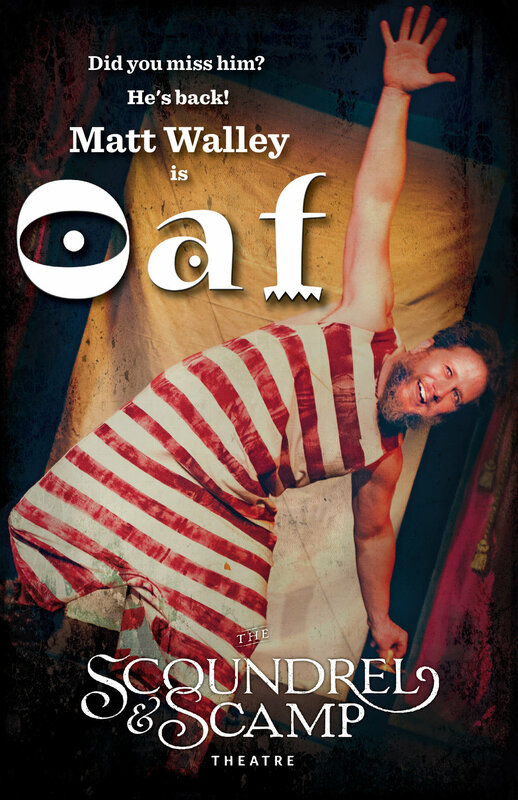 An original work by acclaimed physical theatre creators Wolfe Bowart and Matt Walley, artists in residence at The Scoundrel & Scamp Theatre. An affable carnival sideshow performer discovers that sometimes life's obstacles are self-imposed ... and solutions to problems can appear in strange and humorous places. A comic glimpse into the quirky world of the carnival sideshow alley. Not intended for mature audiences. Bonus! Audiences for OAF will get a preview of Wolfe Bowart's latest work, Cloud Soup. In this award-winning tale triplet sisters are left in the forest by their woodcutter father. From this fairytale beginning, three resolutions are made – one sister will walk one way, one the other, and the third will stay right where she is. Twenty years later, having circumnavigated the globe, and fought vikings, and crossed oceans, and achieved greatness, the three meet again, as women. Cloud Soup tells the story of a tailor who discovers that the adventure he longs for lies at his feet – in his pile of laundry. The tailor’s humble shop becomes an undiscovered world as fabrics magically morph, found objects transform into curious beings and puffs of steam remind us of a time when we saw faces in the clouds. Send a kid or family to see a Scamp Show! At the S&S we are dedicated to engaging audiences that may lack opportunity to experience the impact of theater on our lives. We carefully select our content while fostering a community of artists who can create high-quality theater that immerses and connects with new audiences. To that end, we can use your help, as we can’t do it through ticket sales alone. Our intimate space isn’t large enough to support our quality of production while keeping ticket prices accessible. We rely on supporters like you to make our outreach to new audiences possible. Please take this opportunity to gift a ticket to a child, adult or family who otherwise may not be able to attend the production. Need more theater? Don't miss our Season for Scoundrels!